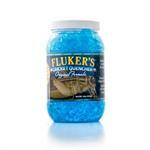 Cricket Supplies we offer are formulated for your crickets and recommended by veterinarians. They recommended food containing a tasty blend of high quality ingredients crickets love and provides 100% of there daily nutrition they need. 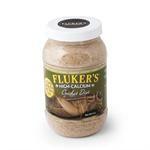 Fluker's High-Calcium Cricket Feed is a premium formula designed for "gut-loading" crickets to increase their vitamin/mineral content prior to offering them as prey to your Bearded Dragon.